So for my birthday (which was about a month ago), tfung took me to the buzz of the town for quite some time, Colette Grand Café. He knew I’d love the décor, and that I was missing the french pizazz as I’d been away from Montreal for some time at this point. Walking in, the visual impact was stunning of course. As we had an early dinner on a weekday (Tuesday), the place was quite empty. Personally, I prefer this, as it is much more romantic and intimate this way. 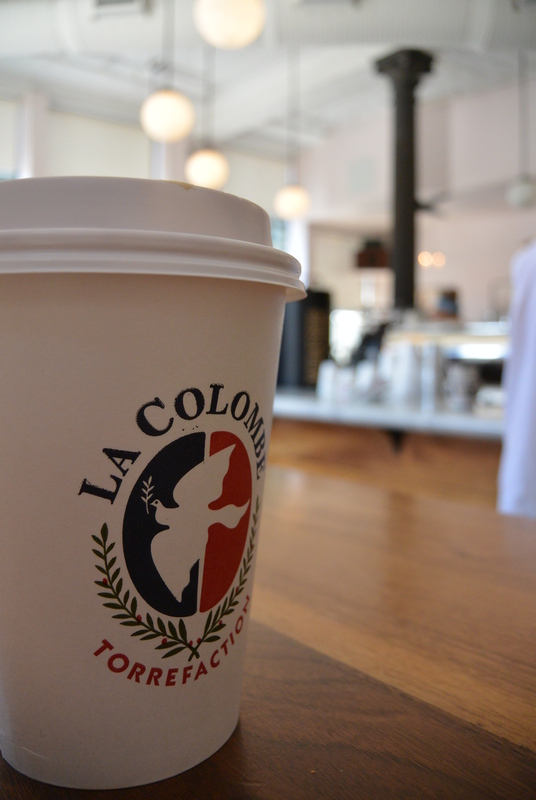 I’ve never done a post about an espresso bar or café before, but I really think it’s time. 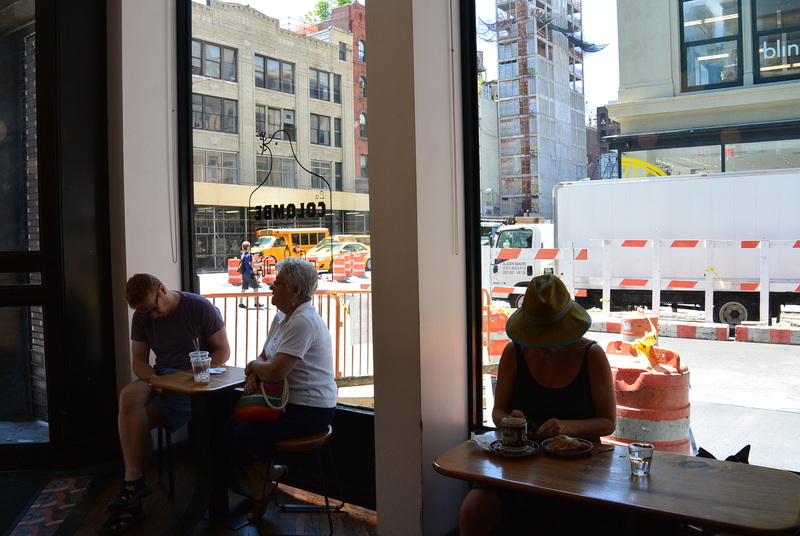 I mostly frequent cafés in montreal, but on my recent trip to NYC, I’ve discovered just how much I’m in love with the whoel culture behind cafés and how terribly awful the coffee is at all the chain stores. Back when I was completing my first degree in Physiology, I fell in love with Starbucks. I went there whenever I needed to study because I’m someone who can’t just stay home to study all day, everyday. My friends started to know me as an avid Starbucks fan, and I embraced that. I knew exactly what I wanted everytime I went, I knew their drinks well and opted for healthier options on a regular basis. When I started my second degree, moving to Montreal was extremely difficult for me. I had no friends in this very foreign city where everyone hated me because I didn’t speak French. In the recent months, I’ve really grown to love Montreal with regards to the life in the city, the diversity of various cultures (ethnically related or not), and first and foremost, their cafés. I’ve been café hopping for a year and a half and still haven’t tried the majority of them yet. I’d like to say I’ve tried half of the more popular and well-known ones, but what do I know! 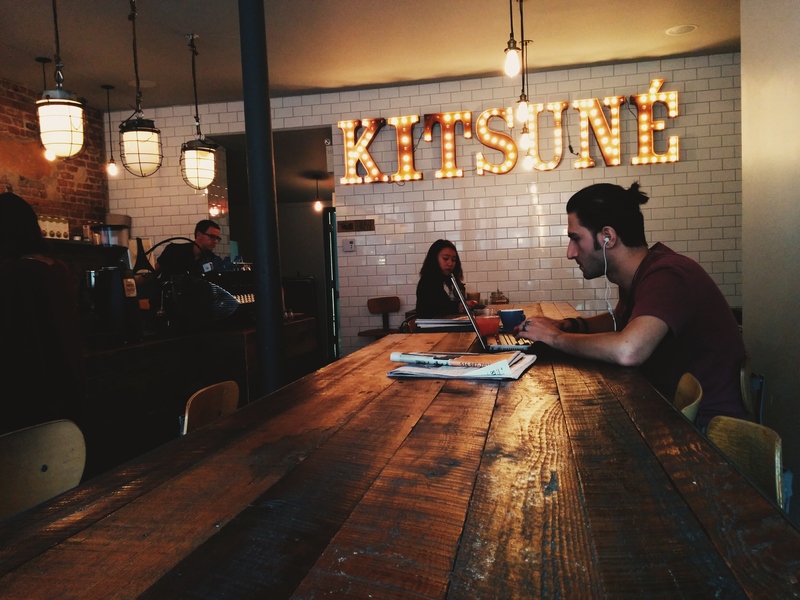 Currently, my favourite in Montreal is definitely Kitsuné. This is for several reasons. Firstly, they are quite close to where I live. Many of the cafés I’ve yet to try are situated in the Mile End, which is a big further for me and requires me to not be extremely stressed about exams (aka, Clinical Nutrition). The second is how easy their payment is. $4, $3.50, $2.50…no fussing with those cents, and the baristas are subsequently a little more at ease and “chilled out” with ordering and paying. They have a sleek iPad to card terminal system which I love and is definitely trending in NYC (from what I see). My favourite to order are their lattes. Be it hot or cold, it always hits the spot for me. Definitely not as rich and creamy as the next café I will mention, but I definitely think in my taste range. Last but not least, the croissants they serve!! The croissants are from a boulangerie called Regal Matinal. 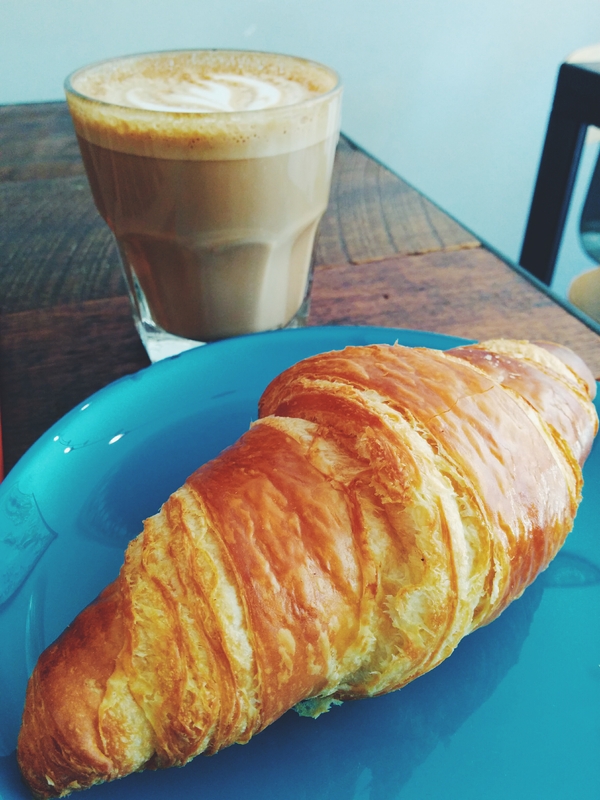 They deliver freshly made croissants everyday, and I’ve seriously contemplated having them deliver it to my house – obviously that’d be terrible news for my cardiovascular health and weight, so I restrained myself. Not to say they’re the best croissants I’ve ever had, but they’re the type I like: doughy, soft and only a slight crunch to it. It is the combination of all this that makes me love Kitsuné so much and regard it somewhere I will always come back to. I love the owner and the baristas he’s hired, I love that they’ve built a small outside patio in the back, and I love the industrial décor they’ve put in place. Other notable mentions in Montreal are: le couteau, st. henri. So as a foodie living in Montreal, it is just obligatory to do this post. tfung and I visited Olive + Gourmando after landing at 8am in the morning from our 2 connecting flights originating from San Francisco. We were tired but I had many errands and calls to make in the morning, which is what I did while he napped. When he awoke, we headed out to this quite famous deli/sandwich shop. 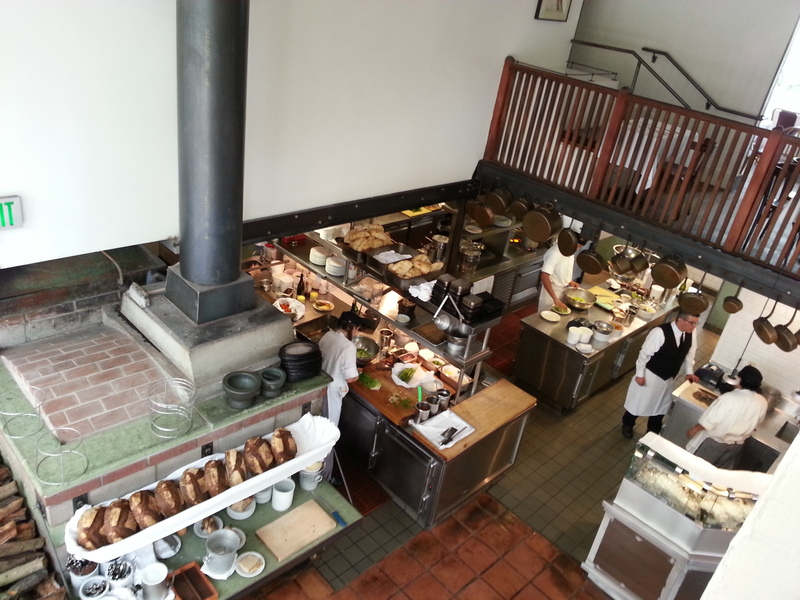 When we got there, it was probably towards the end of lunch service, as it was around 1:30pm. 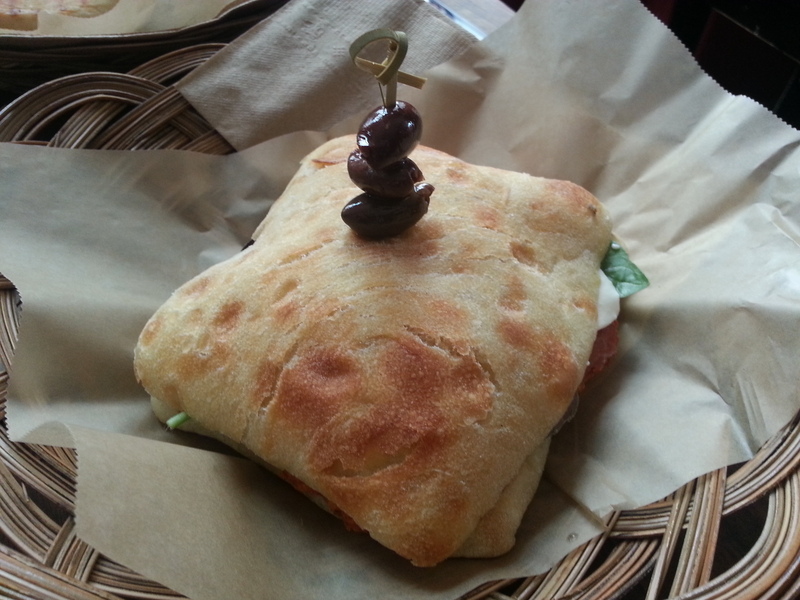 Olive + Gourmando is located on the edge of Old Port. I had passed by a couple times whilst walking around Old port at night, but it was never open. Today we made this trip especially to see why everyone raved about this place! We were seated in about 5 minutes, as no one was waiting to sit-in in front of us. There are actually a lot of people who take-out, so if there are too many people while you’re there, this is a good alternative. The menu is all in French, but if you have a smartphone, not to worry! After a few minutes of studying the menu, tfung and I decided on two sandwiches and the soup of the day. He went to the cashier to order (don’t forget that no one will come serve you at your table!). 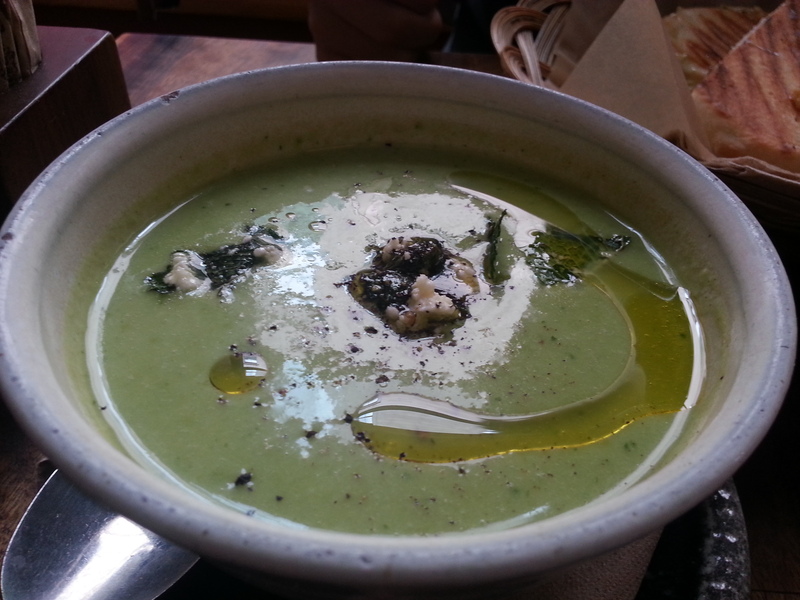 The soup of the day was a cold spinach soup garnished with olive oil, mint and goat cheese. Being the eater I was, I picked out all the cheese for tfung, but enjoyed the flavour that the mint added. I have to say that I’m not used to drinking cold soups, and am still getting used to them. As a result, I didn’t love the soup, but did enjoy that it was quite fitting for the hot summers in Montreal. tfung ordered le cubain, which was a grilled pancetta, with roasted pork, raw milk guyere, with lime, cilantro, chipotle and pickle mayonaise. This sandwich was absolutely amazing. The flavours were so delicious, and the mayo was perfect with the roasted pork. The pancetta was actually quite greasy, which made eating it kind of messy. After the first sandwich though, you can already feel the fat settling, which was unfortunate, as it became much more difficult to finish the rest. I ordered the Antipasto, which came with roasted eggplant, walnuts, Scotstown capicollo, mozzarina, basil, and lemon mayo, servied on ciabatta. This was a cold sandwich, and the basil along with the mayo and mozzarina gave a super refreshing and interesting texture and flavour. I didn’t find the eggplants to be all that great, as it really didn’t have much taste. Having tried tfung’s le cubain, I have to say that I enjoyed that flavour better, but this sandwich is much easier on the stomach. Overall, I thought this place was good. 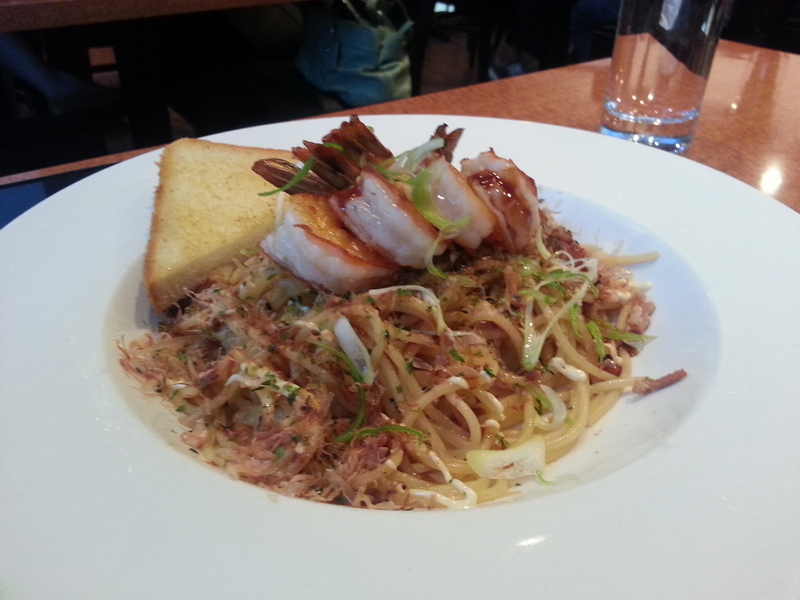 I didn’t think that it lived up to the hype that it has stirred on the internet and in the foodie world. But I did enjoy that they pride themselves in their soups and sandwiches. Their salad selection wasn’t very appealing to me, but they did have lots of pastries that I wanted to try while we were paying. However we were too full to even want to buy more food. Next time I would definitely try their pastries and baked goods, or perhaps even their breakfast menu and update you on my opinions at this legendary shop! On the second full day that we were in Montreal after a good night’s sleep, we set out for Zuni Cafe. Tfung had made a reservation for the two of us for 12pm, but we arrived earlier than 12 and they weren’t letting us in. So we wandered over to the store across from Zuni Cafe. Apparently a lot of people do this, as the owner correctly guessed that we were waiting for Zuni Cafe to open. This store happened to be a very interesting one. 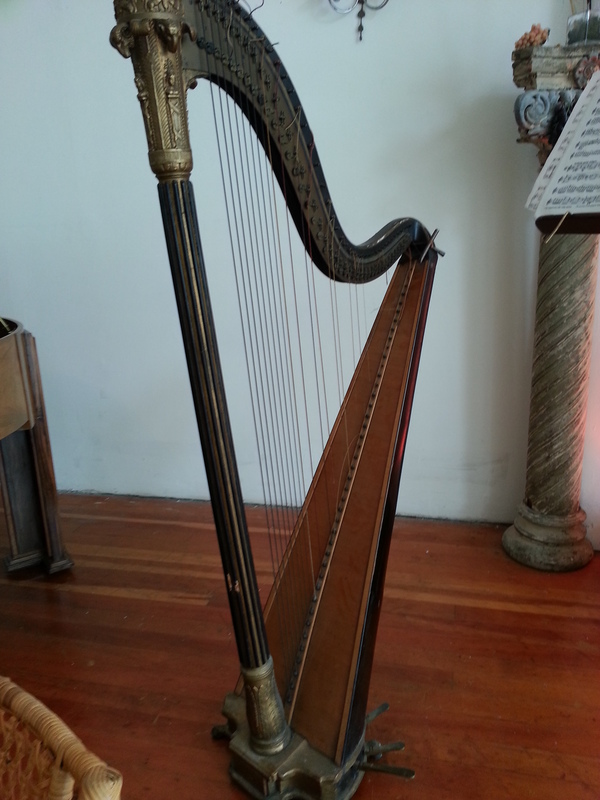 It showcased some beautiful antique musical instruments. Not only that, but they hold monthly concerts with certain themes or composers. We saw a poster for Brahms <3. 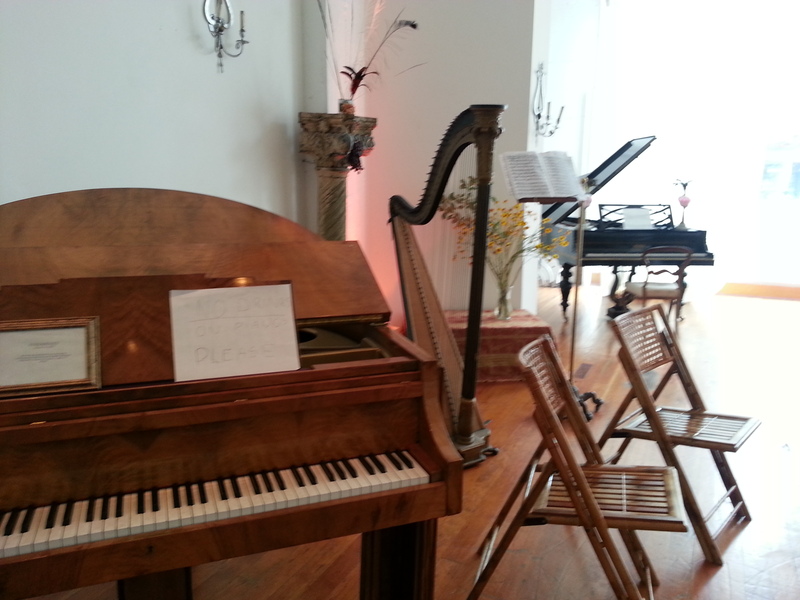 The most interesting piece was actually a piano that was recovered from the building next to the 911 incident site. I thought it was very special and it’s chance encounters like these on trips that make them that much more special. After a quick chat with the owner and admiring the pieces and the space, we started seeing patrons who were lined up outside Zuni Cafe heading in. So we decided to do so as well. We were seated on the top balcony at the front of the restaurant. The actual shape of this restaurant is very interesting, and is long and very geometrical. As a result, we got an incredible view of the kitchen being on the top floor. We ordered quickly as we were starving, and were told that the Roasted Chicken for 2 will be ready in about 50 minutes. So we took this time to take a good look at the kitchen and observing what each person was doing. It was very reminiscent of a tv show I watched about a boy who aspired to be the first chef of a brilliant Italian restaurant. 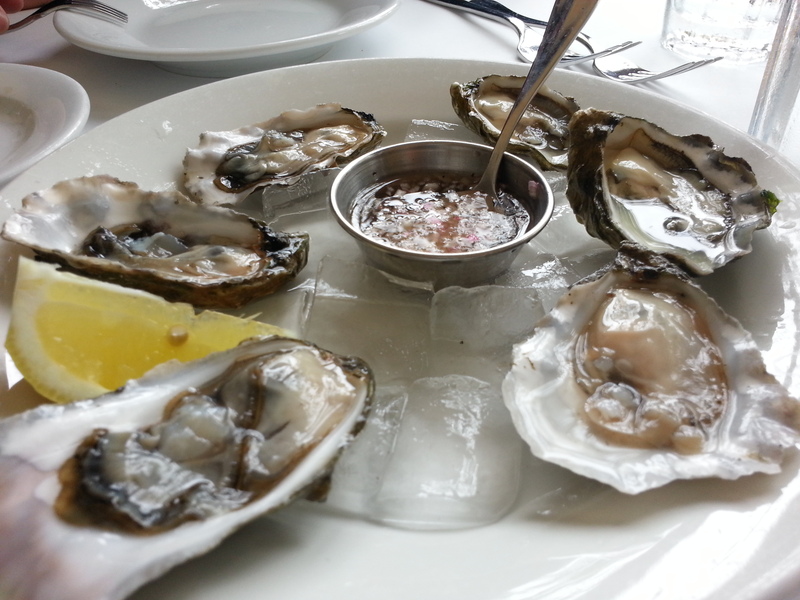 Other than ordering the Roasted Chicken for 2, we also ordered some beloved oysters. They have a fairly longer list of oysters to choose from but we decided to get a Japanese and a West coast oyster (since we were on the West coast afterall). We ordered the Marin Miyagi and the Hog Island Kumamotos. We had Kumamotos before at Rodney’s Oyster House and remembered we had a good experience with it. The miyagi was no where as good as the Royal Miyagi we had at Ferry Building Market which was a little disappointing to us. It had some very fishy taste. But, the texture was very crunchy and creamy. The Kumamoto was pretty good but I didn’t think there was anything spectacular to report. It had a little bit of the fishy taste, but the texture was good. The sauce was just a typical mignonette sauce with vinegar and some shallots. There was a very long lag time between our oysters and the roasted chicken. But as this picture may suggest to you, it was well worth it. We were able to observe the cook taking the roasted chicken out of the big stone ovens. She had set it down on the cutting board for a while to cool off and let the inside of the chicken cook, I suppose. During that time, she made the stuffing part of the dish. 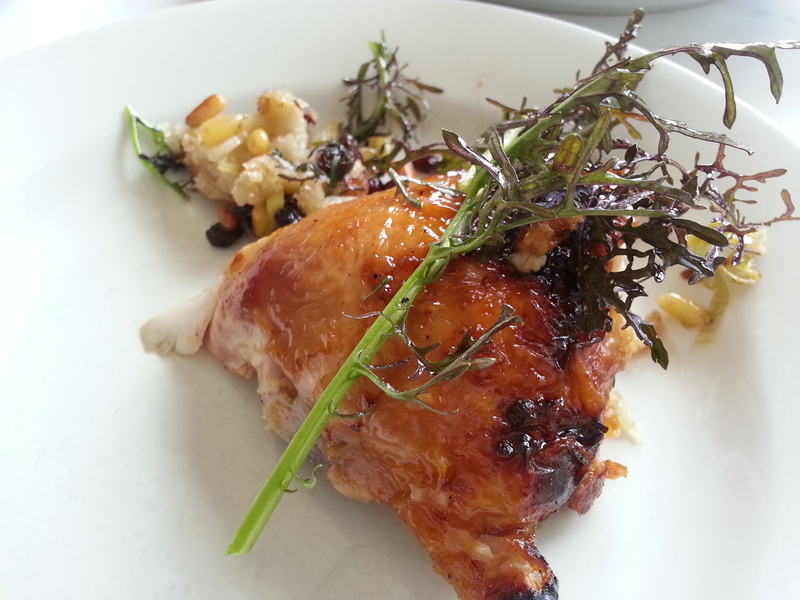 She had bread crumbs, some vinaigrette, pine nuts, dried craneberries thrown into the mix. It was also plated with some greens. The chicken was so delicious. We usually don’t like to order chicken at restaurants because we believe it to be something we can make quite well, just like steaks. But here this dish is a must have! Really is worth the wait. The chicken was so tender and juicy, yet crispy on the outside, all the while taking in all the flavour of the glaze, yet still retaining the fresh flavour of chicken. It seemed so simple yet elegant, for the lack of better phrase. The stuffing was also very delicious. We both love pine nuts and I especially love dried cranberries as well. 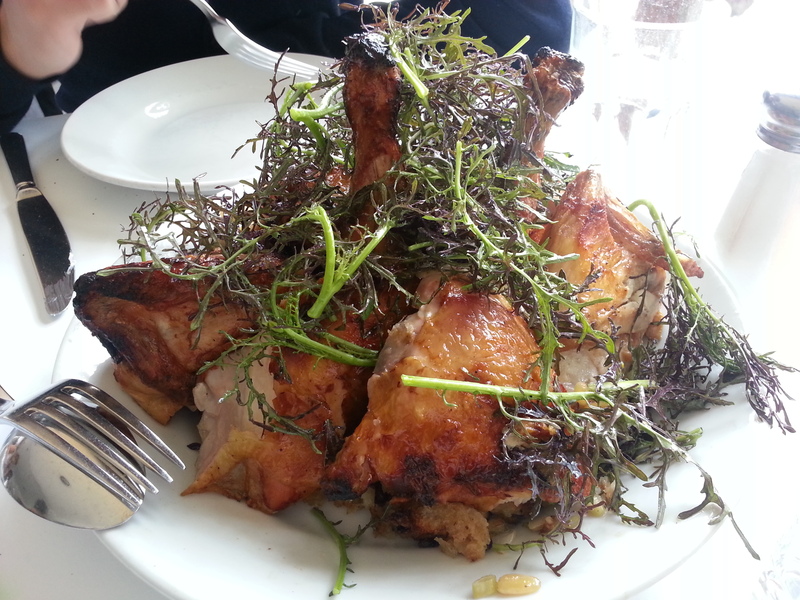 With the greens and the vinaigrette, it was the perfect accompaniment to the chicken. I did think the service could have improved, but I suppose they have to keep a lot of other customers happy as it was a really big restaurant. The waitress was attentive at first but of left us alone after. When the chicken came, she never really tended to us until we had to flag her down to get the bill. The bar was very extensive and I thought it looked very nice with all the different colours. The one fault in the restaurant is that there are only two washrooms in the restaurant. It’s one of those one person per room ones, so it took a long time to wait for it. Especially when there are families that enter the one washroom and spend 15 minutes in there. Overall we had a really good time here. 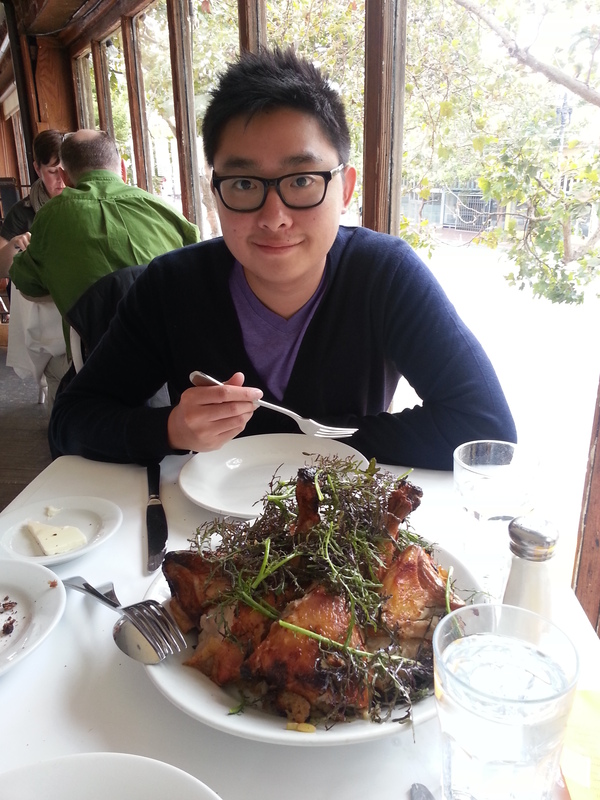 We were seated in a nice spot and loved the chicken. We didn’t think that the oysters were all that great, but as we had been led to believe, the chicken really was the star of the restaurant. If I come back again, I will definitely order the chicken again because it was so delicious. Although we did not get to try their other dishes, we had a glance at them as they arrived at another table and by appearance, they looked good. I may explore other options on the menu next time. On a quiet Sunday afternoon in Edmonton, Duchess Bake Shop is far from tranquil. Karen and I were looking for a place to have some lunch and sweets. Duchess immediately came to mind. The decor is elegant yet simple. The bakery gives you this Victorian feel. It is bright and vibrant, yet classical and comfortable. The environment is perfectly fitting for its name and for the food they serve. You can see that every table is full. Karen and I had to split up: she waited by a couple who looked like they were about to leave and snagged their spot, while I waited in line to place our orders. It took about 15 minutes before it was my turn, but by then I had just enough time to decide what I would like to order from their extensive array of sweets and hot food. Their hot food options were not as robust as their desserts, but there were definitely a few to choose from. We ordered the Pear Tartine with Potato and Leek Soup and the Quiche Lorraine. The Tartine was composed of a bed of chopped lettuce, under warm cooked slices of pear, on a toasted piece of rye bread, covered with a light melted cheese and garnished with fresh pepper. This combination gave a sweet and savory flavour to the tartine that was very appetizing, but not too heavy despite the cheese. Our only complaint was the the hardness of the bread which made it difficult to eat. The potato leak soup was fragrant and had a good combination of the two ingredients (potato and leek). However, the soup was a bit watery for my liking and lacked the consistency of a creamy potato based soup. The quiche was amazing. It was fluffy, light, and moist. Combined with the perfectly browned surface and the flaky, rich, and buttery crust, this is hands down the best quiche I have ever had. Every bite was better than the last and Karen and I had to fight over who got the last piece. I highly recommend the quiche at Duchess. To wash down our delicious lunch, Karen had a Latte and I had a iced Americano. There is nothing special to say about their coffee. Moving on to dessert, we ordered half a dozen macarons, a lemon tart, and raspberry white chocolate scone. The first thing we noticed about these macarons were that they were handsome. The colours they used were not too vibrant, but instead resembled more of a natural look that closely followed the flavour of the macaron. Also, the addition of pistachio and hazelnut on their respective macarons gave them bonus points for presentation. The meringue was not too crunchy on the outside and not too light or airy on the inside, which gave the macaron a bit of chew to it. This was great as we dislike macarons that become almost like a hard candy texture when you bite into it. All the flavours were great and none of the macarons were too sweet (the pistachio and hazelnut stood out as the best ones). The only thing I would change would be to replace the buttercream with a ganache filling, which would give the macarons a more rich flavour and more physical support/structure to them. The powdered sugar and the blueberry just completes the presentation of the Lemon Tart. The tart had a fresh lemon zest flavour that you notice as soon as you take a bite. The sourness is perfectly balanced by the sweetness. The filling was creamy and almost runny, which is a change from the typical jello-y lemon tarts that I’ve experienced. The crust was more on the hard side and not as crumbly as I would have liked. As a result, it was very difficult to cut with a knife. Unfortunately we did not take a picture of the raspberry white chocolate scone, but we felt like we had to talk about it because it was that delicious. The outside was crunchy and the inside was soft, moist and crumbly. The pairing of the white chocolate and the raspberry was amazing. Both flavours were present and one did not overpower the other (the raspberry and the white chocolate flavour in the scone was in perfect harmony). The scone’s combination of the crunchiness and the softness as well as the perfect balance of the white chocolate and raspberry really impressed us. Duchess Bake Shop is a great little bakery and cafe. 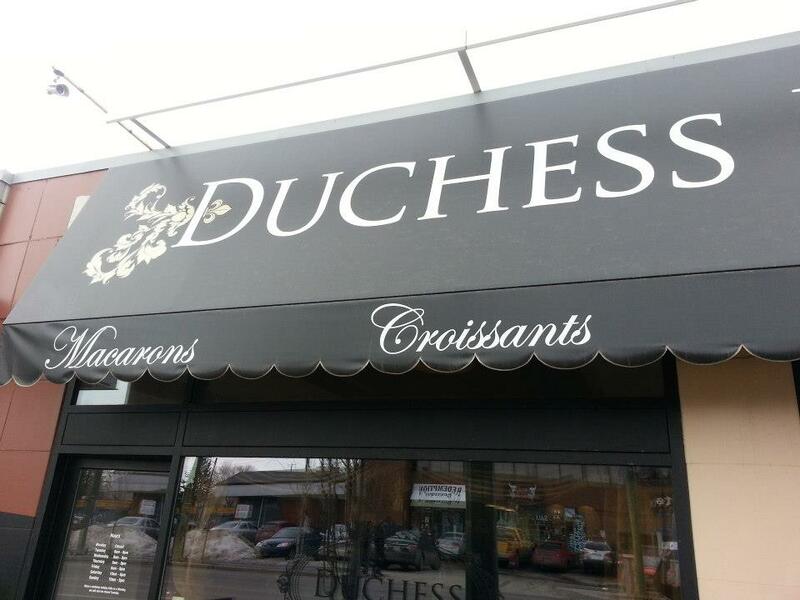 With their beautiful decor to their amazing desserts and hot food, Duchess is a must try if you find yourself in Edmonton. I always love going to Japantown (located on Woodbine, just East of Woodbine). I love their pan (bread) and looking at the cakes. I love the general atmosphere and I’ve never had a bad experience there. There’s always something that reminds me of good times, including the time that I bought two big pieces of sashimi (Salmon and Hamachi) for sushi party at my house, at which we ended up butchering the beautiful sashimi because I did not have a proper knife. Nonetheless, this time my mom and my cousin finally tried the Shiso Tree Cafe. I’ve seen this name pop up in a lot of my friends’ facebook checkins and I finally went and tried it. My cousin got the Shoyu Mushroom Pasta. Shoyu in japanese means soy sauce, so I’m guessing this was made with some soy sauce. I didn’t taste much of it but it had a sweet taste to it. Being a mushroom lover (haha) I loved this dish. But the sweetness of it did throw me off at first. My mom ordered the Shrimp Okonomiyaki . Okonomiyaki is actually a pancake dish in Japan, and it’s famous for the very unique sauce that is used. I used to love okonomiyaki-flavoured chips (and still do) by Calbee, so I’m a huge fan of this sauce. The shrimp was of good quality and had the perfect texture. However, they had put some cheese in the dish. It didn’t match the Asian flavours at all and being someone who generally doesn’t like cheese unless it works really with the dish, I felt that it had ruined this for me. I myself got the Shio Clam Vongole. Shio means “salt” in terms of ramen adn that’s kind of what I took it as in this. 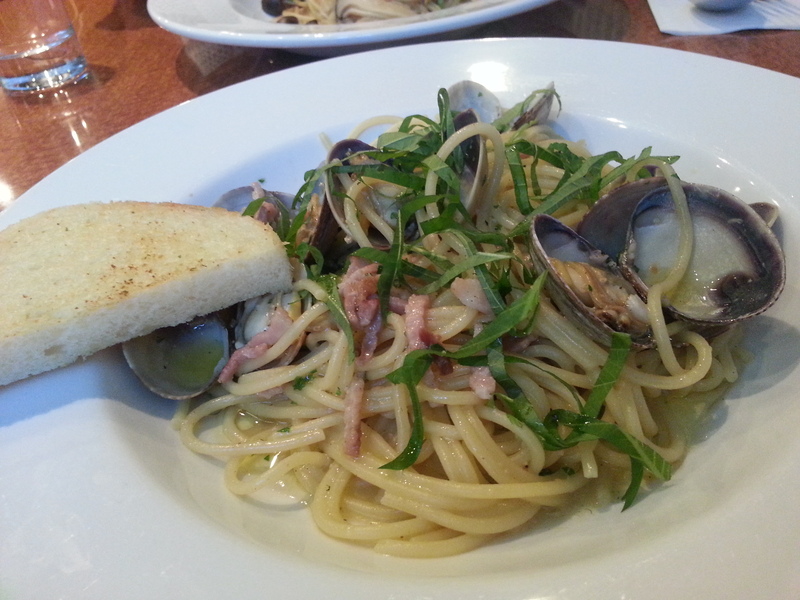 There were some basil leaves in the dish and the clams were quite good. It was a little oilier than I would have liked but I did like the taste. 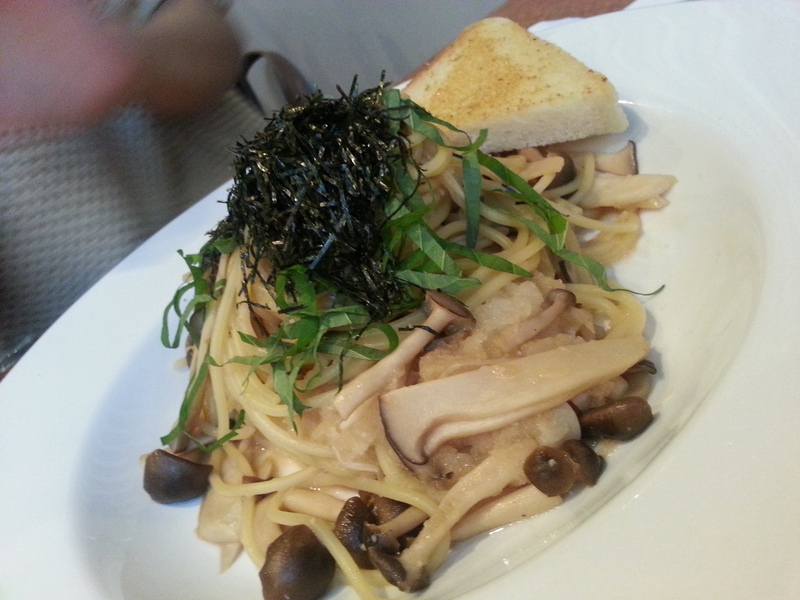 I have to say that the mushroom pasta was my favourite though! I really do love Japantown, even more so after visiting Japan. I love the way that Japanese people have the discipline and will power to excel in everything they do. Each individual isn’t a Jack of all trades, but whatever they specialize in, they will perfect it. They are so efficient and have so much respect for the jobs even if they don’t like it. This is something that I think we all need to learn from. Anyway, the service was quite good, the waitress knew exactly what we wanted and didn’t need much explanation. I hate the places where I have to explain myself to them. I’m not a patient person and at a restaurant is where I want to relax and enjoy. If I have to over-exert myself just to get the waitress to understand it usually turns me off. And this place did a perfect job of that! I had never ventured past Spadina on foot on any street. However I did see on instagram a picture of this cafe and the caption “Guava Cheesecake”. I love guava flavoured drinks and was very interested in trying this cheesecake. This cafe is located on Queen West, in the Fashion District (that I didn’t even know existed). My cousin and I walked here on a really nice day, and we really enjoyed the walk, as we discovered lots of new shops (fabric and bling-bling bead shops) we would never have been able to find. It’s funny how you’ve lived in a city for so long and because you don’t venture out of your comfort zone, there are always places you don’t know about. Arepa means corn meal bread that’s very prominent in Columbia and Venezuela. This particular cafe is Venezuela-based. We arrived and were pretty hungry. 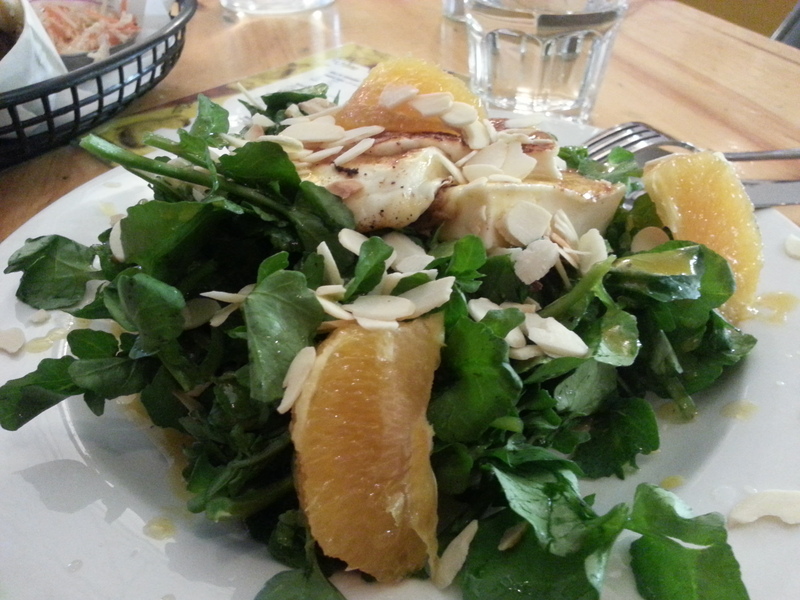 I really wanted to eat a salad, and we opted for the Watercress in orange vinagrette, with oranges, sliced almonds and warm fresco cheese. It was really refreshing on this day, and a really fruity tasting salad. I’ve recently started to notice a lot of watercress salads which is interesting and new to me, since I’ve only ever had watercress in the Asian soups that my mom likes to make. We also ordered la llanera, which comes with beef tenderloin, avocado, fresco cheese and tomato. We were also given condiments to add, including garlic mayo, pesto and peppercorn. It was pretty good, but the beef was really dry. The condiments made a world of difference in terms of adding some moisture to the dish. The corn meal bread was something that I hadn’t tried before. It was interesting, but I don’t think I’d consider it something I’d pick over other types of bread. 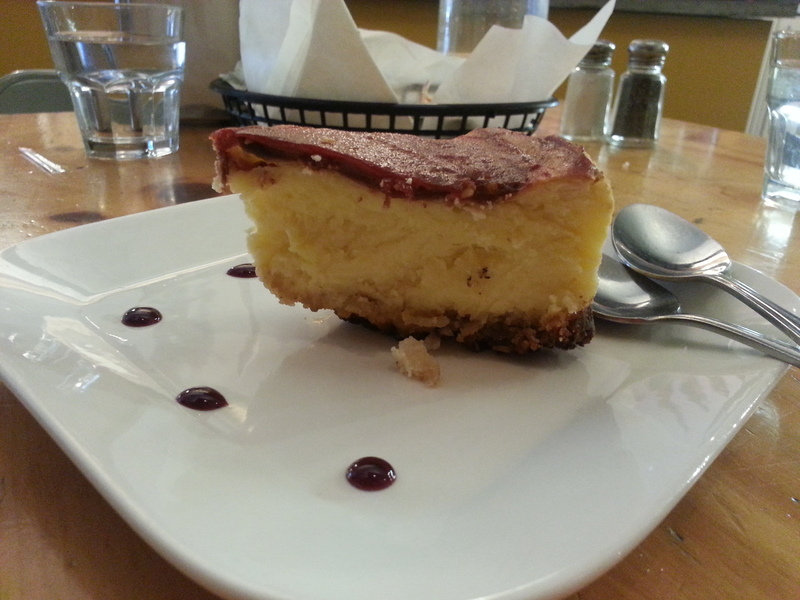 Finally, we got to the reason I had discovered this restaurant in the first place: the guava cheesecake. The dish was decorated with guava syrup dotted on the side of the plate. I have to be honest, this cheesecake failed to come even close to my expectations. Perhaps I expected too much…Either way, I was just having a regular cheesecake, and there was almost no guava taste. The little guava icing that was on the top was of true guava flavour, and didn’t do much for the cheesecake. The base of the cake was an interesting mix of oats and granola though, which was something I hadn’t seen much of before. Overall this cafe is cute and is a nice place to go if you want to try something new (or at least it’s new to me, as I’ve never had Venezuelan cuisine before). The food was decent, and came quite quickly. 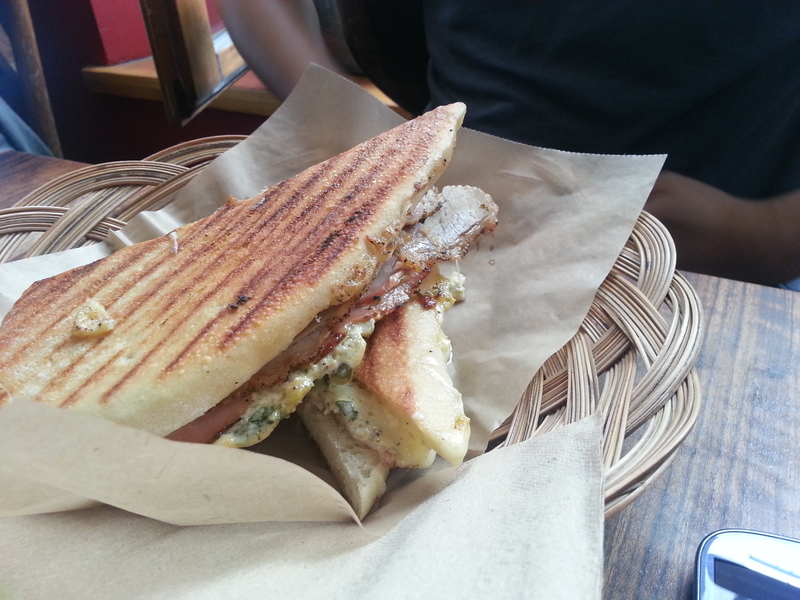 The service was attentive but not annoying which can be hard to achieve in a small cafe. Although I enjoyed my experience, I don’t think I’ll be visiting any time soon, as corn meal bread does not appeal to me, and the guava cheesecake was a disappointment. As for the salad, I am confident I can make something quite similar at home. 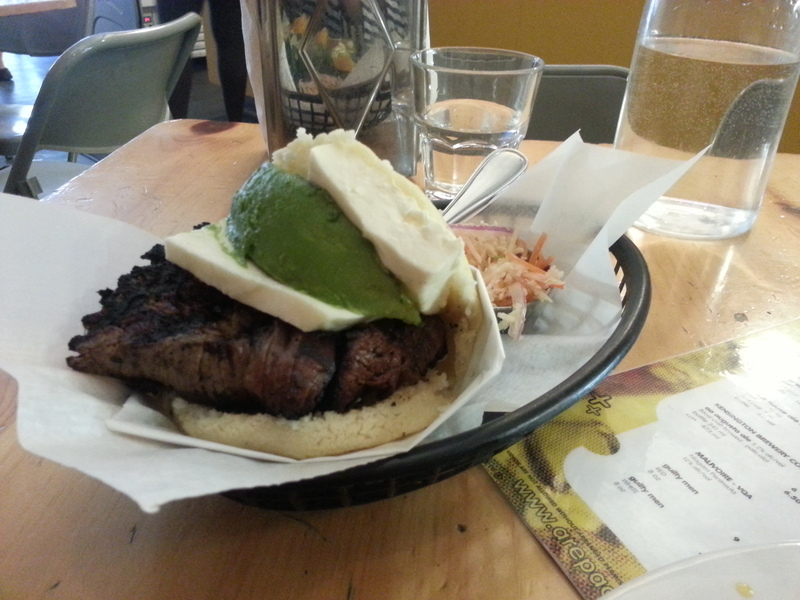 But if you’ve been wanting to try some new flavours, I do suggest you to check out their arepas! 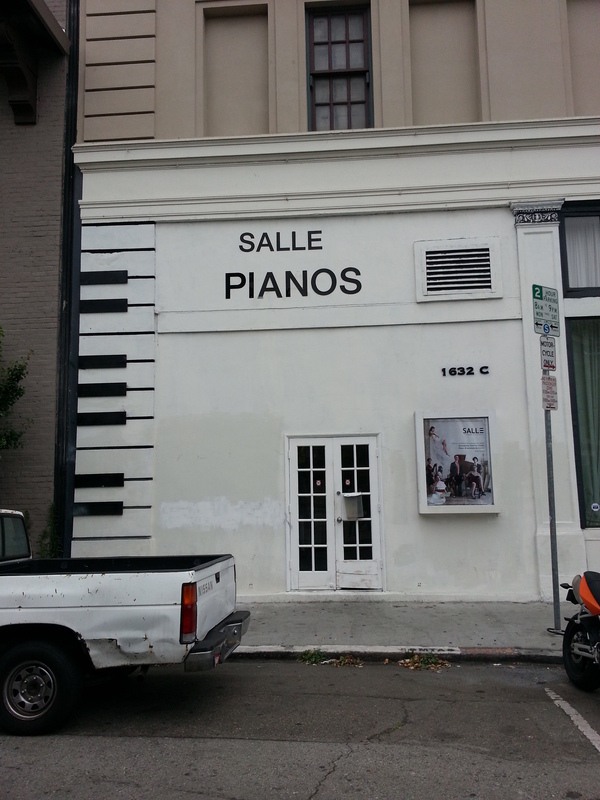 I had noticed this super hipster looking restaurant when I went to Fabergé for brunch one day. I described it to my foodie friend without a name and she excitedly told me she thinks it’s Voro, which is a restaurant that she had been wanting to try. The restaurant was opened by an artistic individual (who is also a friend of a friend of my foodie friend..), with a vision that this restaurant will not only provide good food, but will serve as a “hangout” place that locals love to come back to. It has an industrial feel, with a super long table at one end of the restaurant which is perfect for large parties. The reason I was intrigued by this restaurant that morning on the way to brunch was actually because I saw people studying at this table, even though it looked like a restaurant. 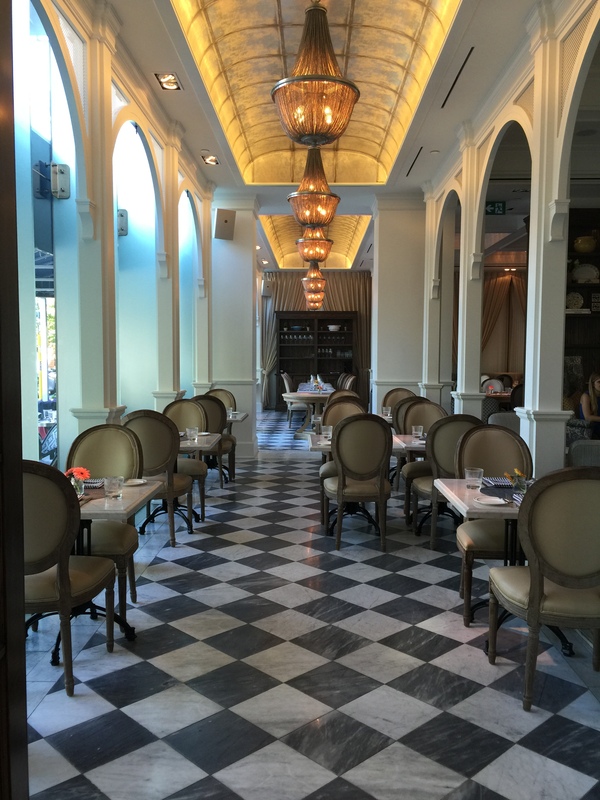 We were seated at a round marble table which reminded us of very european cafes. We had exactly the same idea to order many appetizers and just share them, as the main dishes didn’t appeal to us at all. Their appetizer selection was more than 3 times the size of their main, so it made sense to us. 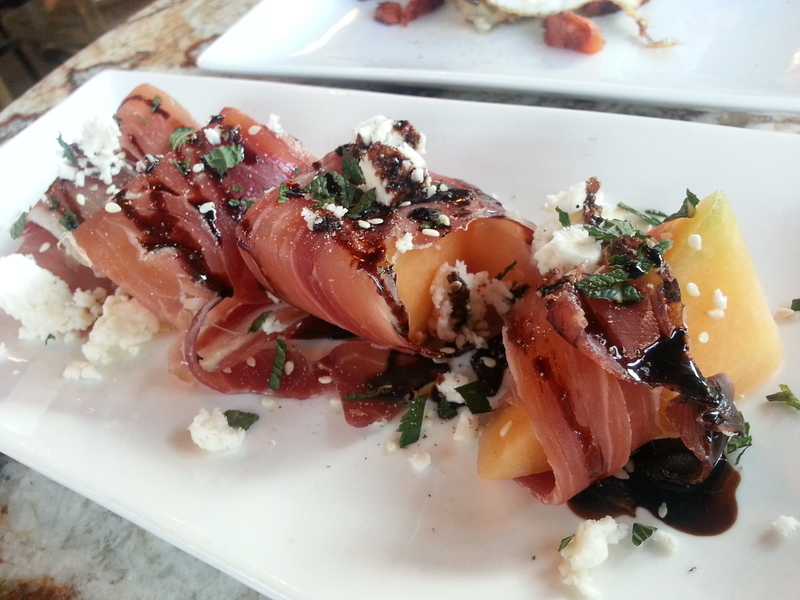 We started off with the classic prosciutto and melon combo. But this dish, they featured my favourite reduced balsamic vinagrette, feta cheese and mint! 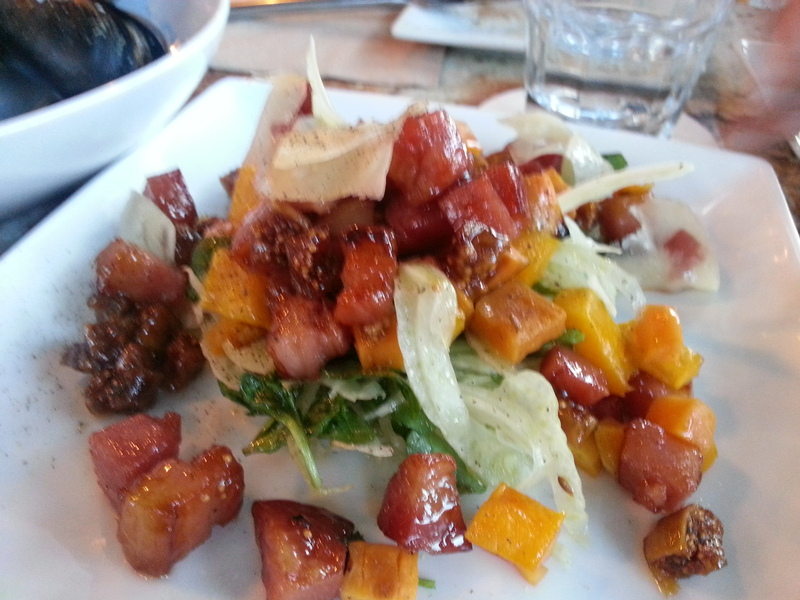 The combo was absolutely perfect and was among one of the best prosciutto-melon apps I’ve had. The dish was priced at a fair $8. Next, we ordered the Potato Tart with Chorizo and fried egg. 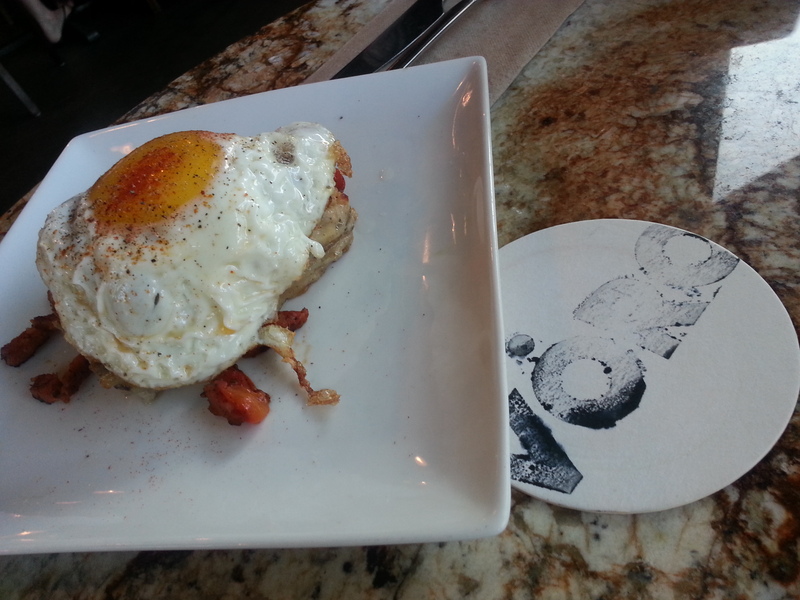 The fried egg came garnished with some cayenne pepper. The presentation of it made us super excited, as it was difficult to see what the potato tart looked like. Being the foodies we were, we cut the fried egg open to take a better picture, and the potato tart looked pretty ordinary at this point. We dug in, and it was pretty mind-blowingly delicious. It was a layered potato and tart combo, with the chorizo on the side. 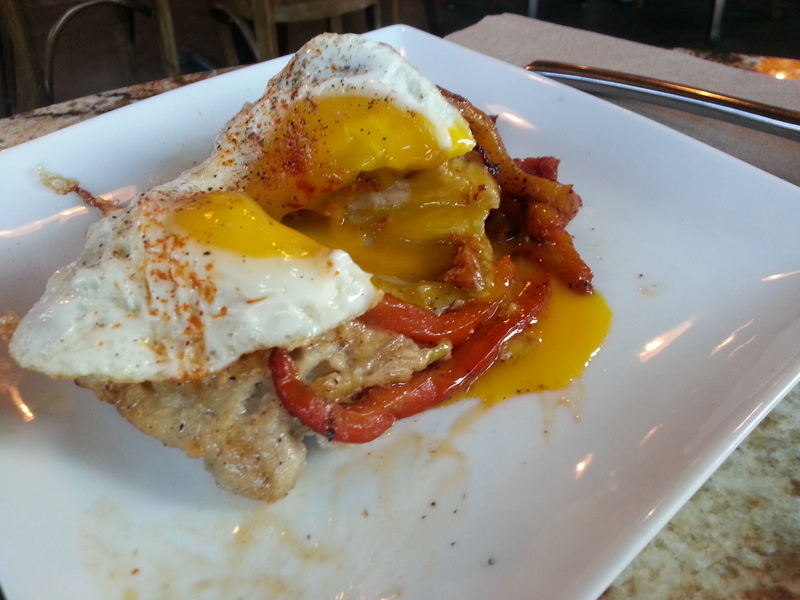 I really loved this, and the seemingly ordinary fried egg just adds incredible texture to the whole dish. This dish was $12. Finally, we ordered the mussels which was the Main of the Day. It was pretty good and had a very good balance of the licorice flavour with the cream and wine. The balance of the cream and wine was one of the best that I’ve had in a long time. Most restaurants use more wine than I would like. 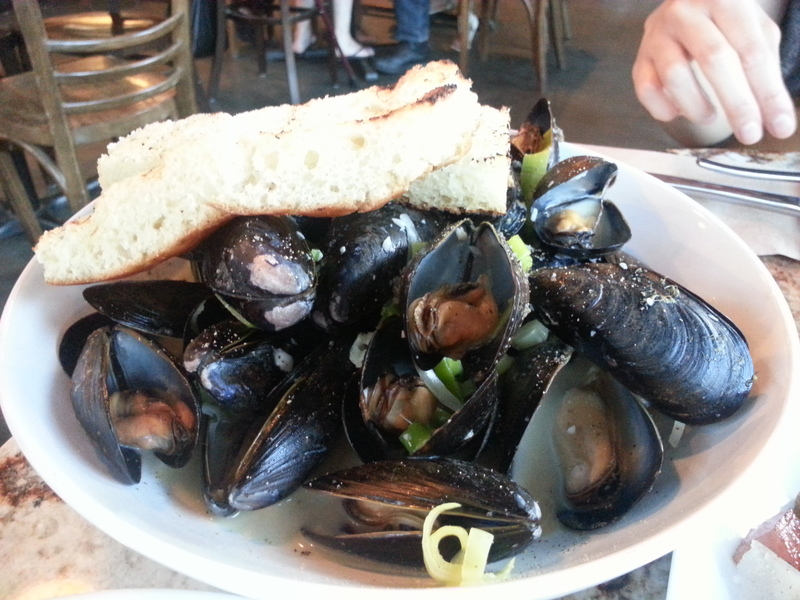 The mussels weren’t super fresh, as they shrunk a little already, but the flavour of the dish was amazing. 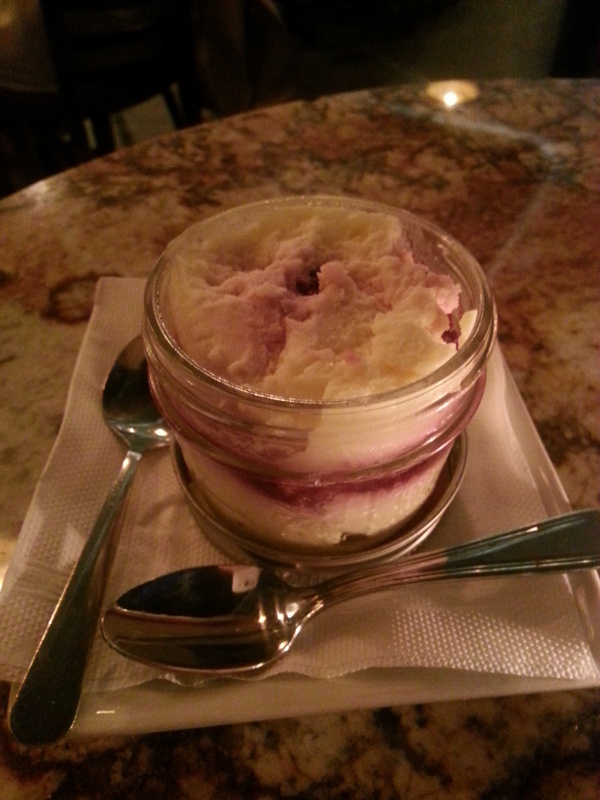 For dessert, we had the Raspberry Trifle. It was pretty good but nothing worth noting like the rest of the dishes we had that day. The service was quite good, the waiter was very attentive and not one of those absent-minded ones who ask you the same question more than once. He was a little playful and had good suggestions when we ordered our appetizers to have them come two at a time so we’re not overwhelmed. I absolutely loved this place, the food, the atmosphere and the service. I highly recommend anyone who likes simple but genius dishes that don’t use extravagant ingredients to try Voro.